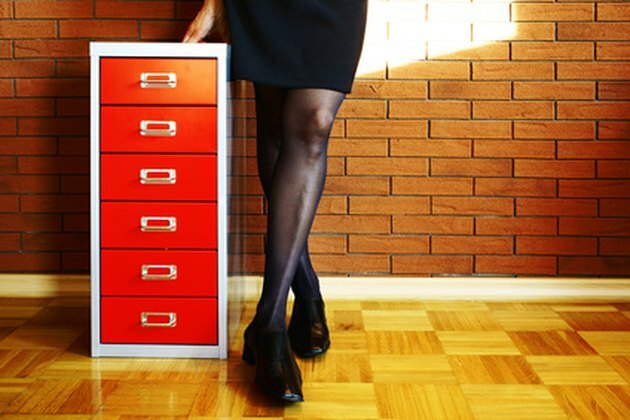 Filing cabinets are a common accessory in offices both private and public. However, as useful as these storage compartments are, the drawers do occasionally get stuck. While your first reaction might be to kick the filing cabinet, there are other ways to get a stuck drawer to open. The drawers in a filing cabinet may be a little tough to open sometimes. Make sure that all of the other drawers in the filing cabinet are closed. Also, be sure that the drawer isn't locked. Lever the drawer up with the prybar. The filing cabinet drawer has to slide on a track, and sometimes the drawer can fall down below the track. So lever it up and pull the drawer out. To get the drawer back on the track make sure that the rollers beneath the drawer line up on the track, and that as you push the drawer in the rollers are sitting in the groove of the track. It should fit like a train wheel on a track. Remove the drawer above the stuck drawer. You should be able to look down into the stuck drawer and see if there's something inside the drawer itself that's keeping it from being opened up properly. An example could be a too-tall file that's rammed up against the frame of the filing cabinet. Pull out the obstruction and then open the filing cabinet drawer that was stuck.